As it happens, I don’t have any vices, bar my love for chocolate. It is strong and powerful. Sometimes, it feels like it is a perfectly good reason to exist. Given a choice of dessert or an ice-cream flavour, I always go for the double and triple chocolate ones with lots of chocolate sauce on top, if possible, please. 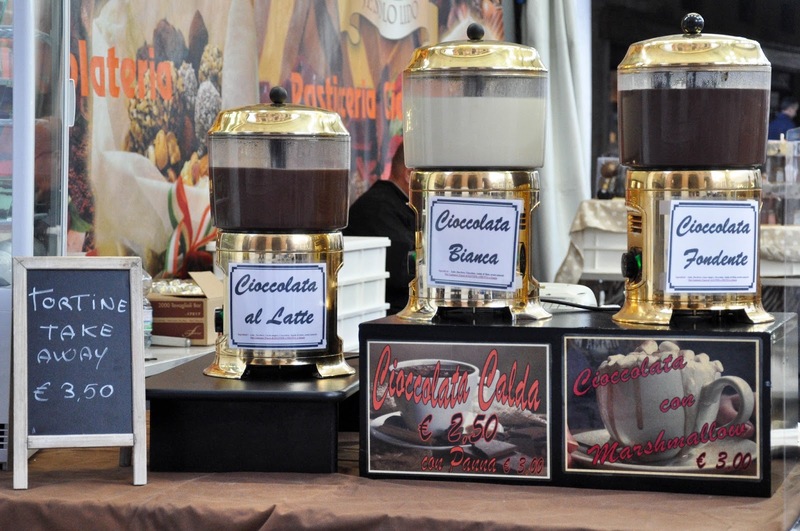 And, since moving to Italy and discovering ‘proper’ hot chocolate, having a cup of this thick and gooey soul-satisfying drink is my way of saying: ‘Stop the world! I want to… enjoy my chocolate!’. 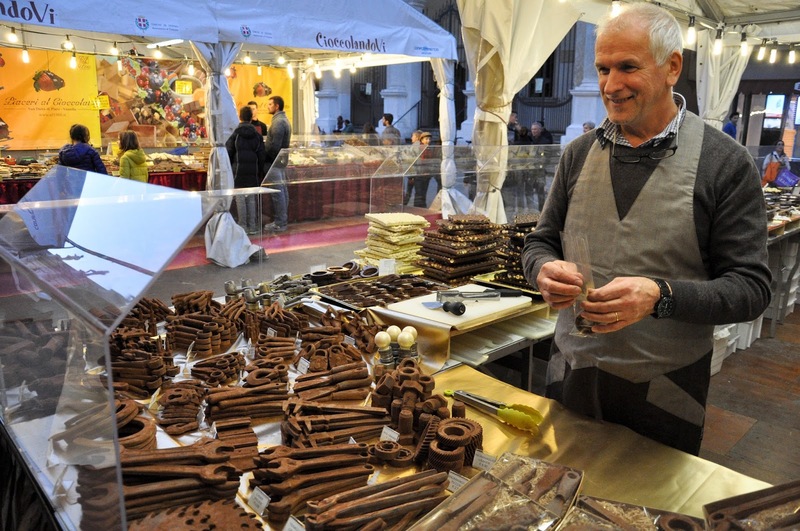 So, when last year – two months after settling in Vicenza – I found out that the city holds an annual three-day long Chocolate Festival called CioccolandoVi, I couldn’t believe my luck. Or, as it transpired, my lack of it. As it happened, last year’s edition of the festival coincided with a pre-booked week-long trip back to England. 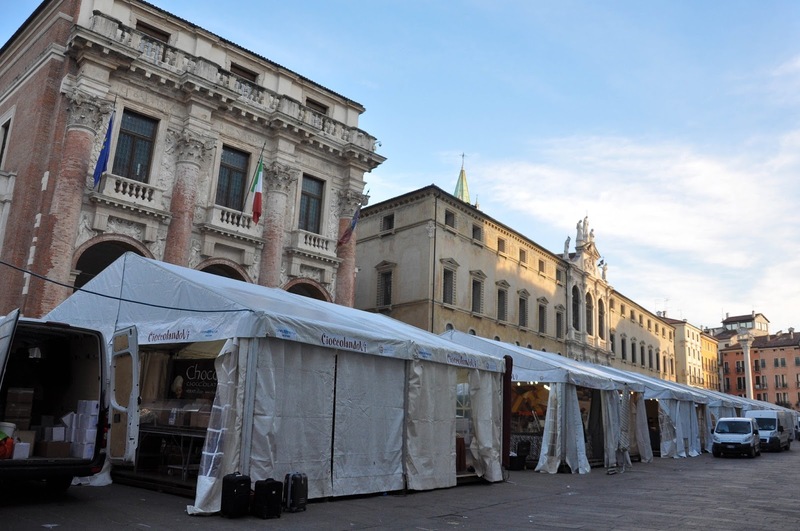 Believe it or not, I thought about cancelling the trip, perhaps postponing it, but in the end it wasn’t quite possible, so I had to settle for waiting for a full year, so that I could experience Vicenza’s Chocolate Festival this October. 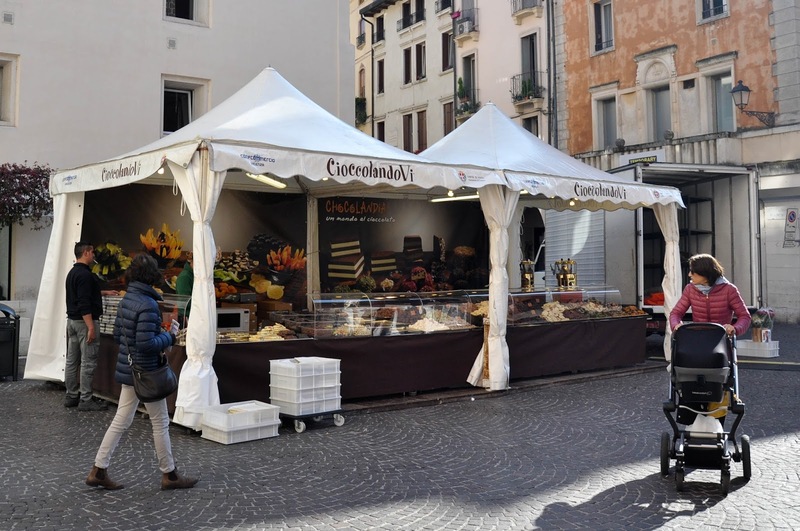 Needless to say, the anticipation was such that I hotfooted it to the main square in town – the splendid Piazza dei Signori – early on Friday morning, eager to start my chocolate adventure. 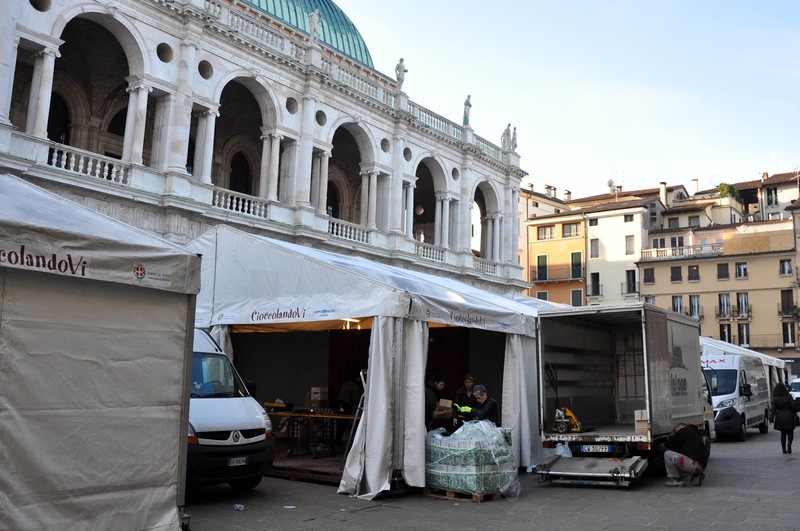 At 9 am though the stalls of the chocolate makers, who had come from all over Italy, were just being set up. All around me people were hurrying to and fro, unloading vans and small trucks stuffed to the brim with tons and tons of chocolate. Boxes were carefully lifted, glass displays were attentively dusted, tables were being covered with stretches and stretches of fabric. 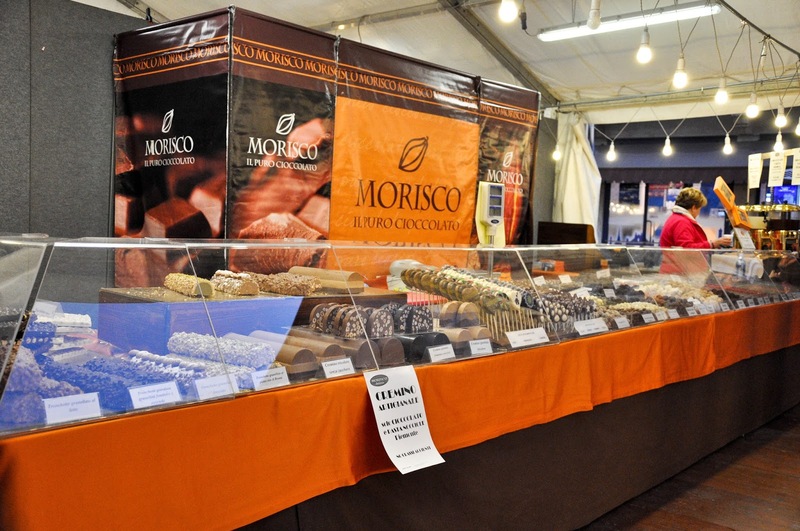 The more early-rising of the sellers were already arranging their displays with lavish collections of truffles, slabs, dipped dried fruit, figurines, cubes, rolls, lollipops, disks and bars – all made of chocolate. Dark, milk and white, enriched with nut pastes, sprinkled with cacao dust, spiced with cinnamon and even paprika and curry. It was looking promising! 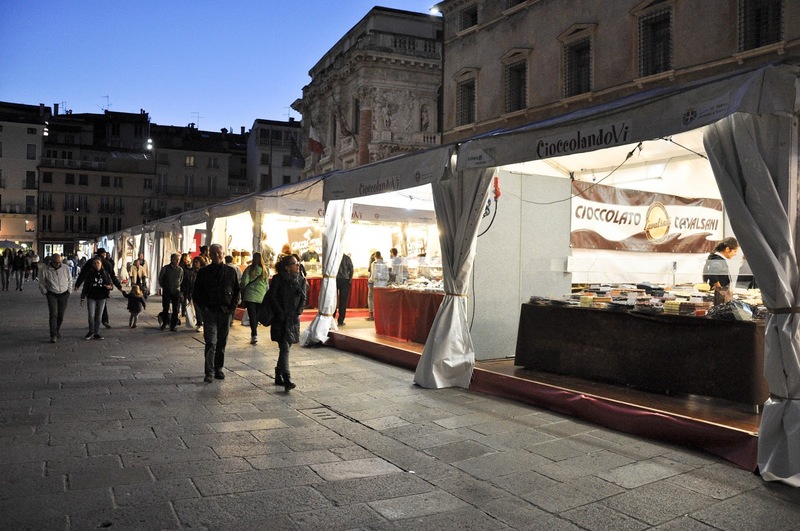 So, I decided to return to the piazza in the late afternoon, when the festival would already be in full swing. 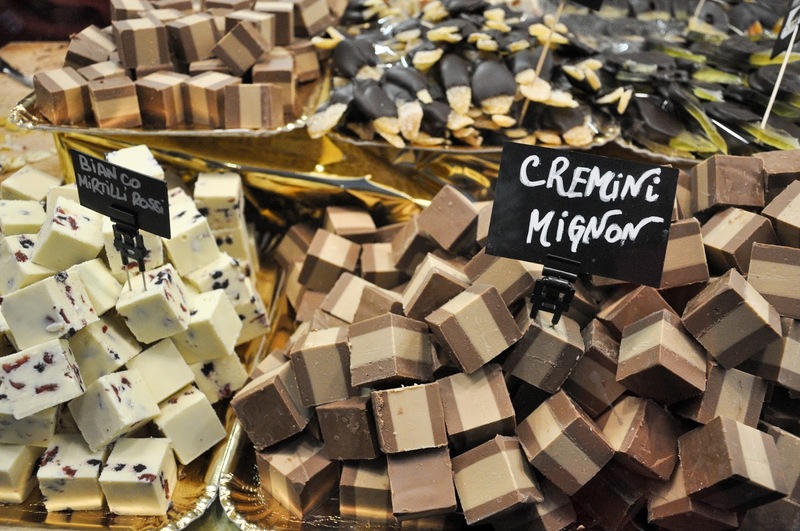 Which countries come to mind when you think of chocolate? 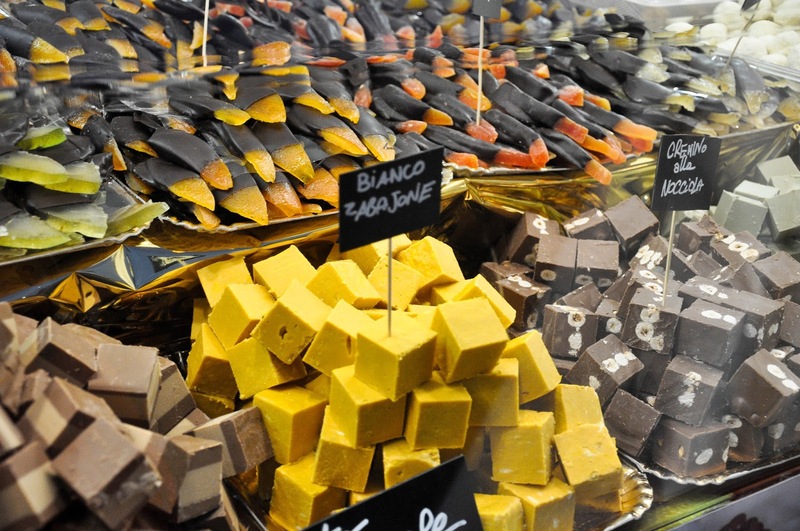 I have to say that my first point of reference is always Switzerland, followed by Belgium and, since spending some time in Barcelona a few years ago, I give a little nod of appreciation to the Catalan chocolate tradition, too. But Italy?! Well, as it turned out Italy is altogether something else! This is not just the birthplace of the ubiquitous Nutella which winks at you from the shelves of any supermarket around the world. 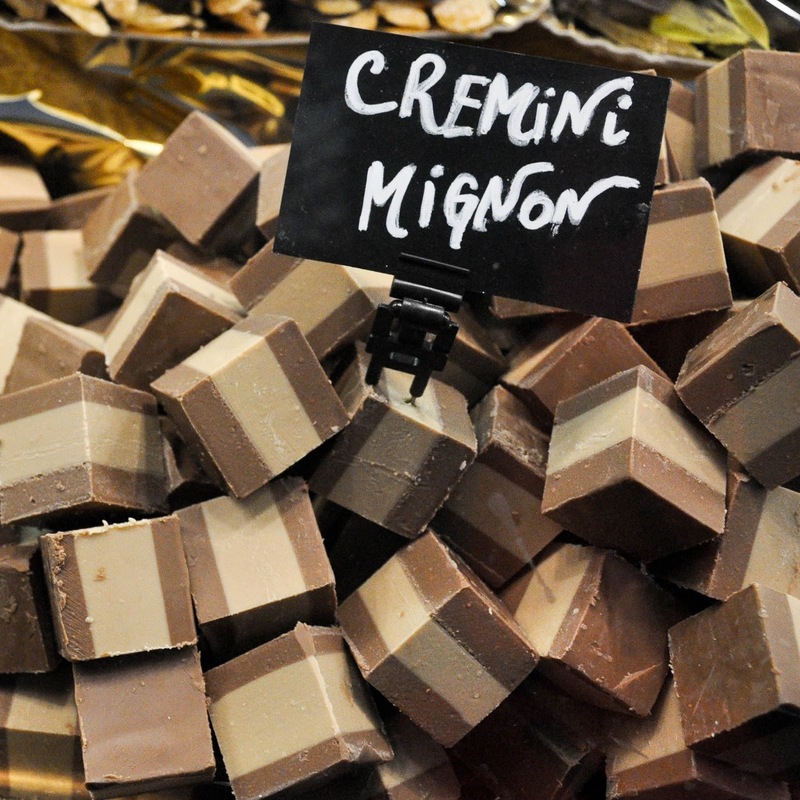 This is also the place where gianduja and cremino were created, hot chocolate was adapted to the taste of the European palates and some of the best selling chocolates in the world – like Baci and Ferrero Rocher – were developed. 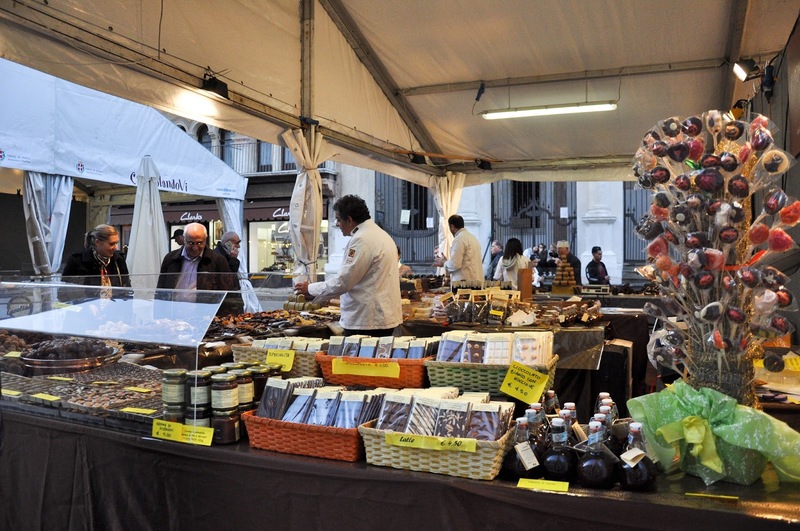 Every autumn countless festivals in celebration of the local rich chocolate heritage sweep all through Italy – from Perugia (home of some of the best Italian chocolate brands) to Turin (the birthplace of gianduja – a sweet spread with one third hazelnut paste to two thirds chocolate). My own first encounter with Italian chocolate (apart from Nutella), was as a child, when my parents, every now and then, would buy a box of the fabled Baci. With a name meaning ‘Kisses’, a couple kissing in a passionate embrace pictured on the lid and with each chocolate wrapped in a silver foil stamped with blue stars within which a strip of paper printed with a romantic saying was hidden, Baci seemed so grown-up and sophisticated to me. 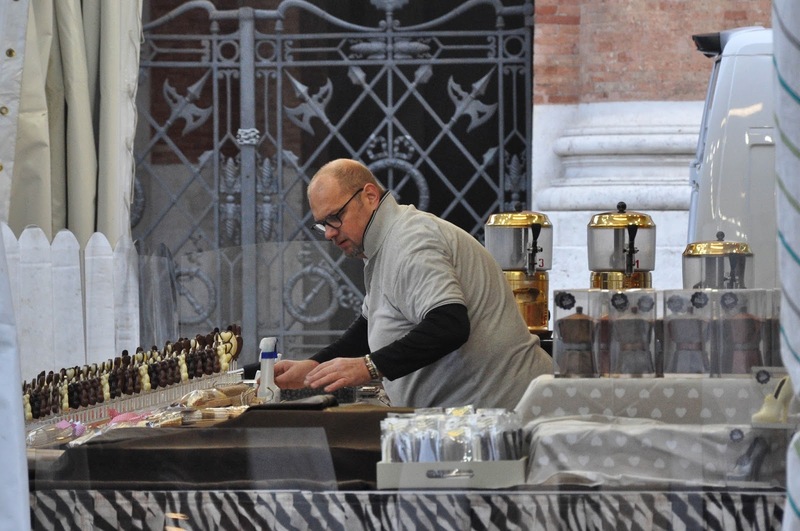 And since moving to Italy I have taken every opportunity to explore further the Italian chocolate tradition, especially in the form of small chocolate-making patisseries like the one at the top of this list. 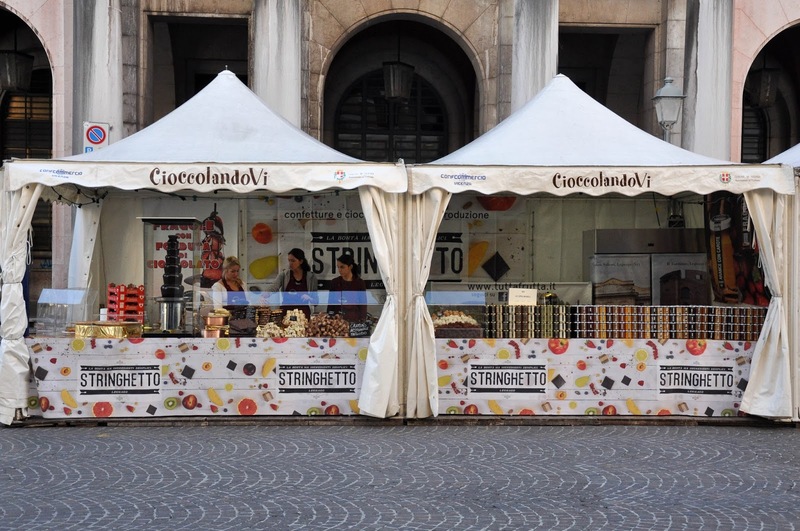 Deep in chocolate-inspired thoughts, I headed back to Piazza dei Signori on Friday afternoon. My husband needed little persuasion to join me. The stalls, now fully set up, were doing a brisk business in the quickly descending dusk. The sellers were gingerly placing in cellophane bags delicate truffles rolled in dessicated coconut and thinly sliced or chopped nuts. People were walking around with smiles on their faces, holding cups of thick hot chocolate topped with whipped cream. Happy endorphins were floating in the air. It was all I could do not to do a little dance. Our first purchase was a bag of these Pringle-shaped chocolates from the above stall. 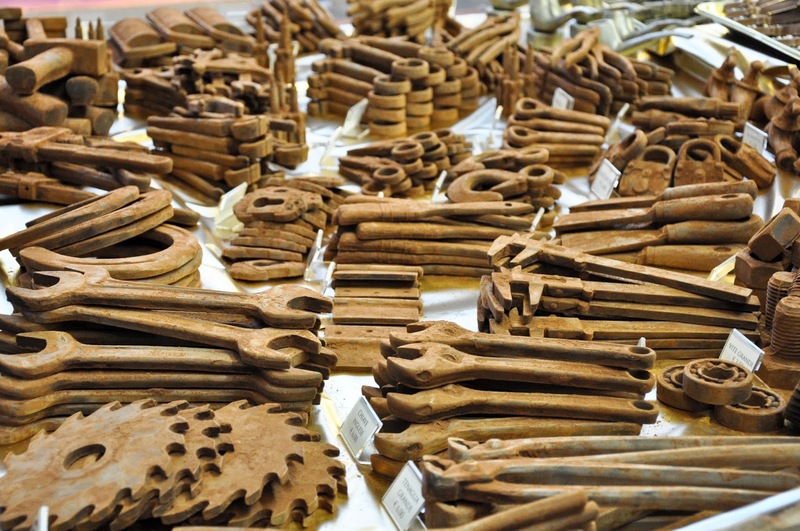 Enriched with dried fruits and spiced with different flavours, they were the perfect start to our chocolate tour. We tried the ones with coconut, raspberry, cinnamon, cacao nibs and paprica. A little nibble here and there was all I needed to sample as many flavours as possible, without overwhelming my palate. 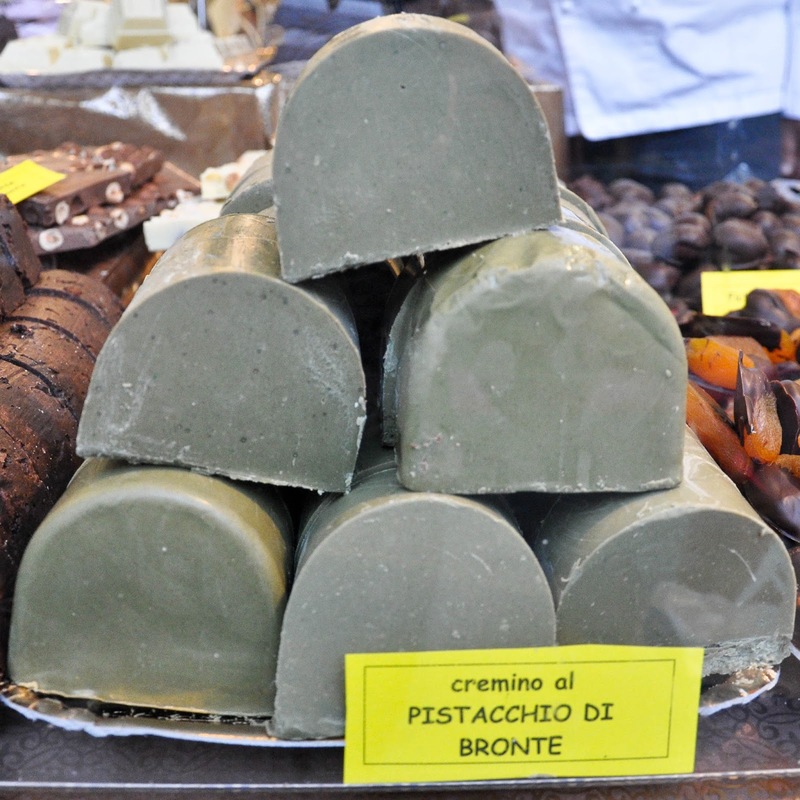 the cremino al pistacchio di Bronte – made of white chocolate and ground pistachios from the comune of Bronte in Sicily. It was rich and smooth, satisfyingly melting on the tongue. the many varieties of cremino which we tried. 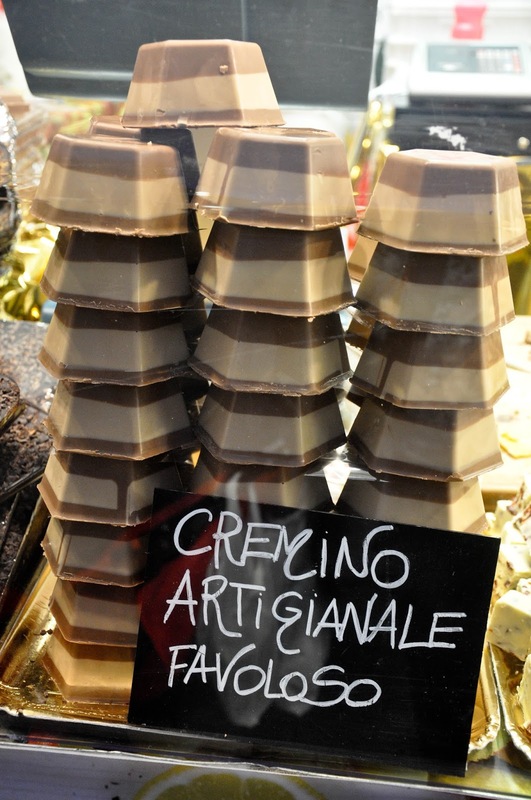 Cremino, traditionally, has three layers – the outward ones are made of gianduja and the one in the middle is coffee-flavoured chocolate paste, but at the festival there was an overwhelming variety of cremini – made of nuts, stuffed with dried fruit and/or whole nuts, produced with white chocolate and even flavoured with egg-nog or zabajone in Italian. 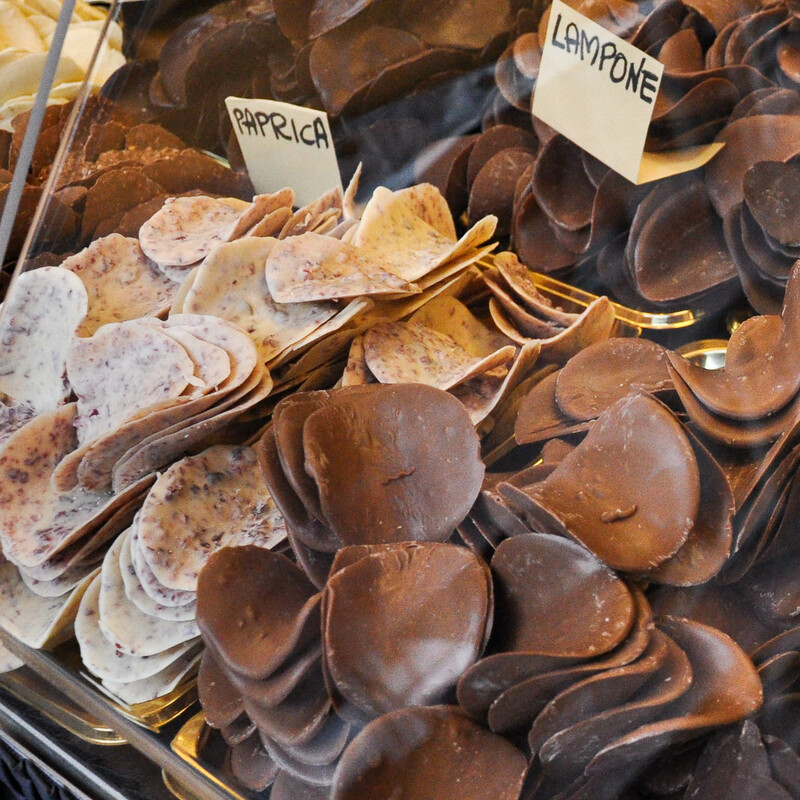 In terms of chocolate: one of the things we bought was a chocolate-dipped fig. In all honesty, I was having sweet visions of a soft crystalised fig gently enveloped in the finest chocolate, but instead got a lump which was hard to bite into. It turned out that inside it there was a whole dried fig, stalk et al. Upon finally managing to biting a piece off it, the chocolate shell shattered into million pieces, most of which fell on the ground. Boo! So, yes, I was bit disappointed. In terms of the festival as a whole: it was all lovely and good. Just marketing doesn’t seem to work on the same level here in Italy as in England. Had this event been held in London, for example, stall holders would have been busy handing out business cards, brochures and generous samples trying to share their story and what makes their business unique. As it happened, I didn’t see any business cards, so if I didn’t take a picture of a particular stall with its name on it, now I wouldn’t be able to find the respective company, check their website and become a repeat customer. 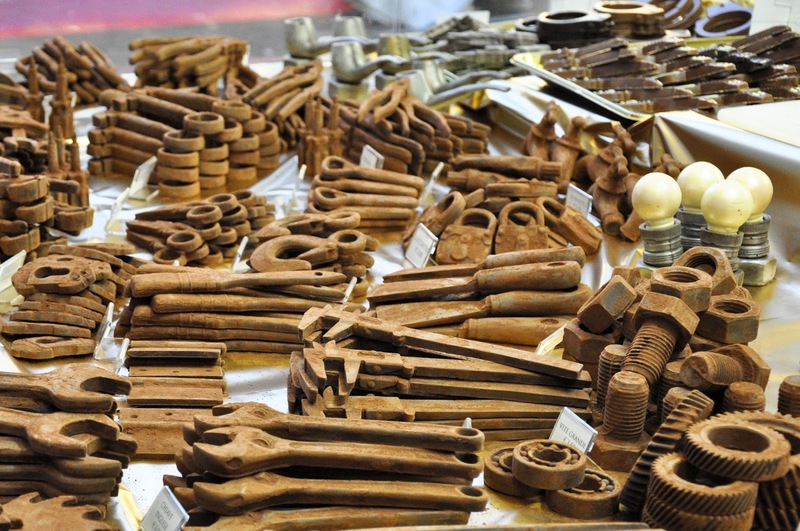 As for my husband, he got really excited by the chocolate moulded as a mind-boggling variety of tools. There were nuts, there were screws, there were screwdrivers, scissors, bearings, allen keys, wire cutters, even light bulbs. Made of dark chocolate, they were dusted with cacao powder and had this rich taste, which made us salivate like babies. At that moment, I remembered attending an ‘Introduction to chocolate making’ fun afternoon at one of the artisan chocolate studios in London a few years ago, where we were told that good quality chocolate stimulates the production of saliva in the mouth. There it was! 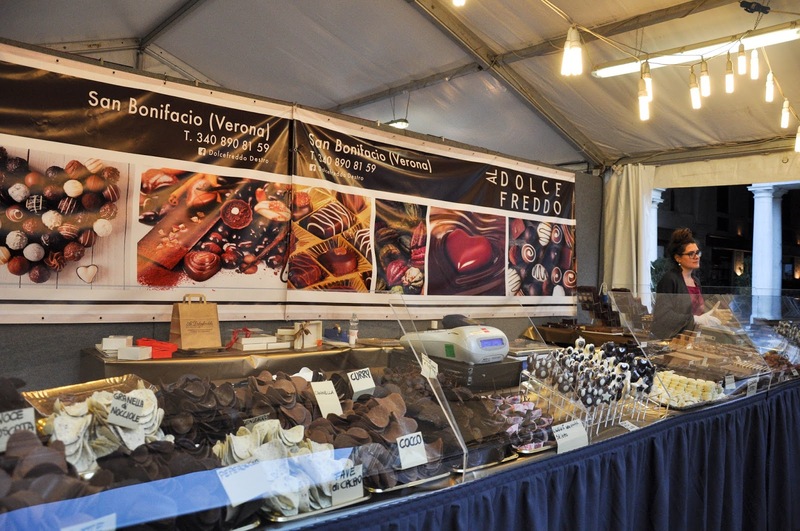 The proof that, indeed, we were in the presence of exceedingly good chocolate at CioccolandoVi – the Chocolate Festival which is held every October in Vicenza, Northern Italy. You should definitely make sure to visit next year! Now, if you excuse me, I have to do something without any further delay. 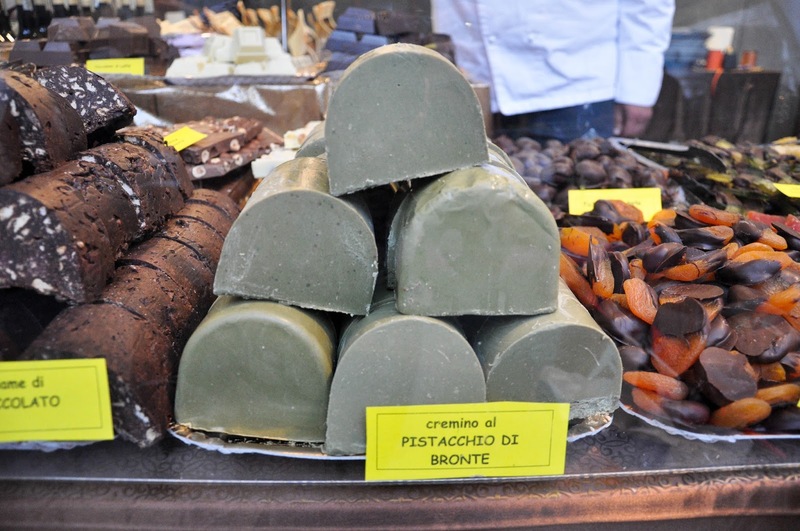 You see, this big slab of cremino di pistacchio which we bought on Friday is calling my name and it would be rude to resist. Ta-ta!